Just before the May DUR competition i got my new 6cm Transverter working. Before I faced some problems with the multiplier chain. 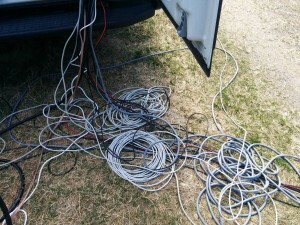 Murphy made that saturday afternoon i burned the control circuitry of the SMA bistable relay – poff. So i had to exchange it with my own sequencer circuitry that needs some highside FET switch to do that job. 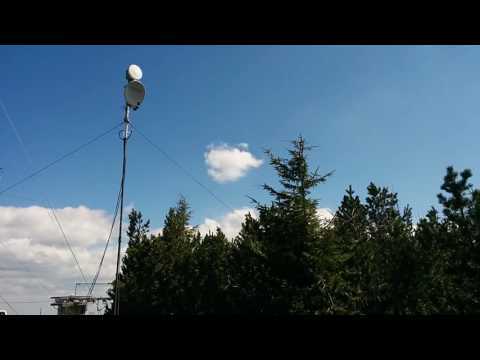 I used a dual-band ring feed i made for tests and connected it to a old 60cm dish. The result you can see on the photo below. 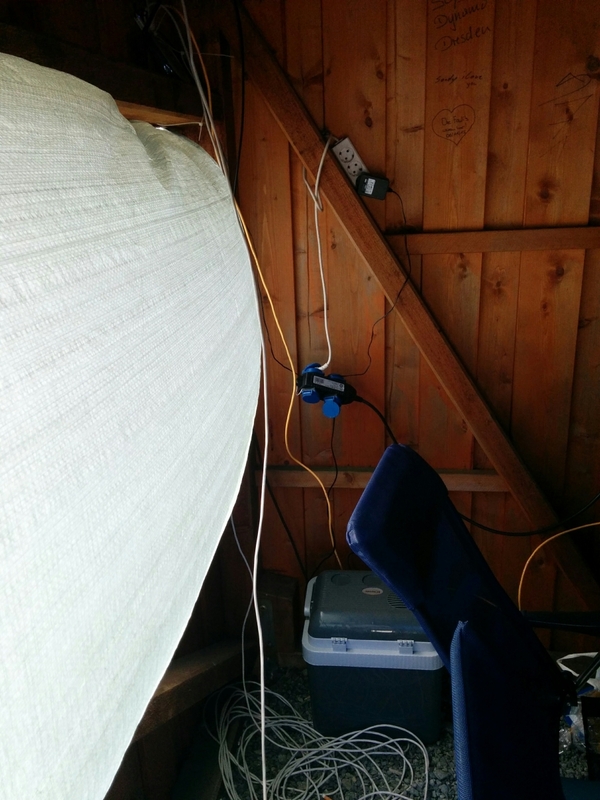 Very beta version ;) The PA is still missing and therefore i had only about 250mW. I also wanted to take 3cm with me. In order to limit the amount of equipment i decided to minimize effort for 23cm. 13cm is out of order at the moment anyway. That means only using the former Wimax patch antenna for 9cm. Next steps for 6cm will be adding driver (ordered from China) and the PA (10W, already here) as well as creating some better feed suitable for the mesh dish. 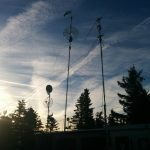 My goal is to operate 23/13/9/6 with one mesh dish. This time i had a neighbour in JO61XA. DM4SWL was operating few meters away on 23cm FM only. Thanks for taking the foto ! 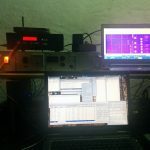 I was not qrv from JO61XA for a long time. Now there was the chance to take all the equipment to Triebenberg again. During the last months i tried to repair some things here and there. The 9cm transverter got a new alignment and is working now. Saturday morning i collected all the stuff and partly assembled it. I wanted to go for 23/13/9cm and 3cm eventually. 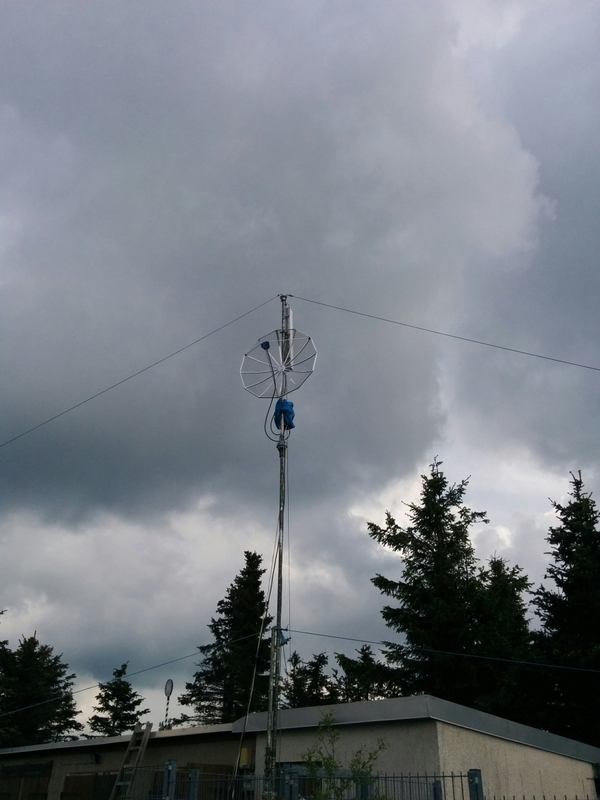 This time i used the 1m dish that i bought last year in order to save some time during the mast construction. 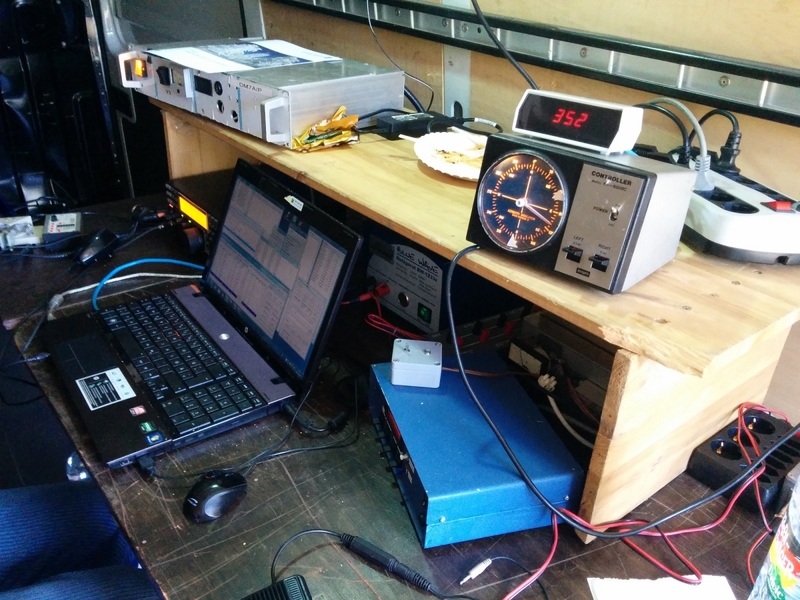 In the end i was qrv 1 hour after beginning of the activity. So what… The goal is to test the hardware. 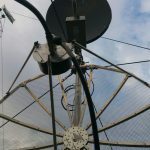 First observations were not that promising: 1) bad connection of the DC supply for the mast transverters 2) control unit for the rotator was not working. The later one was really bad. Later at home i noticed that i partly disconnected the cable for the display / keypad unit when fixing some loose screws few weeks ago. For 3cm i picked a second IF transceiver. Unfortunately the wrong one. The IF is 432MHz but i took the FT-290 instead the 790R2 ;) RX/TX switching via the mimic for the 2m based transverters from the FT-817 was not working but it took me almost until end of the test to find out what was going on. So only 1 QSO there. 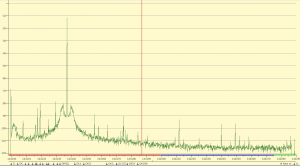 Also 23cm seemed to have some oscillation in the RX LNA. I got some very strange sounds from time to time when releasing the PTT. 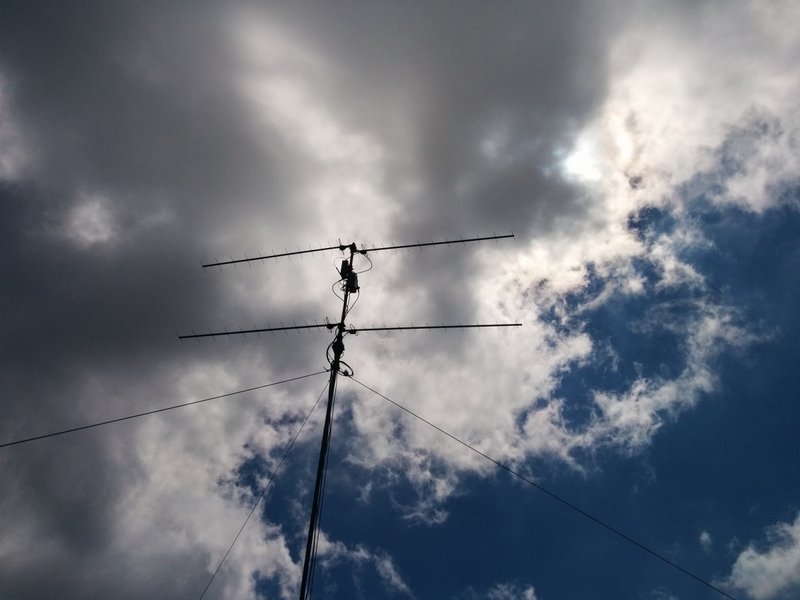 Maybe some feedback from the 13/9cm transverters because of the PTT mimic i use (i switch all chains to TX but only transfer the IF to the one i want to use. Decoupling is only 50dB which might be an issue. I need to investigate there). 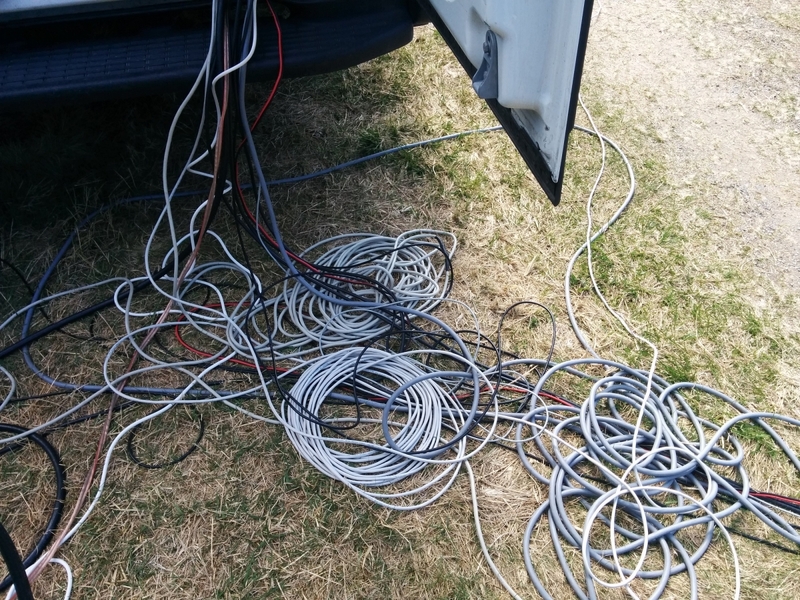 Finally, when deconstructing the mast, i was a bit optimistic on the way to remove the ropes and had a very robust takedown of the antenna and transverters. The main impulse was taken bei the box of the 13cm transverter. Fortunately only the plastic box splitted into several segments. 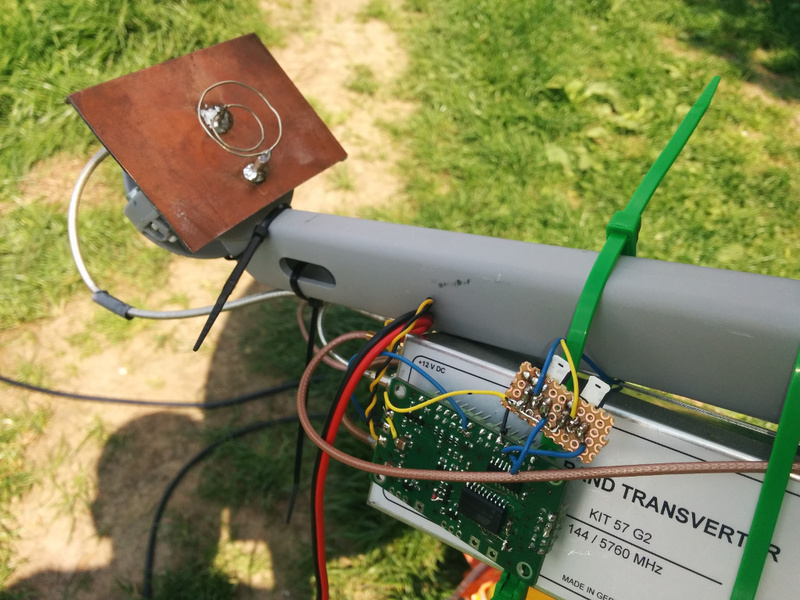 The transverters are still working fine… lucky operator ;) I anyway want to put it into a common box with the 6cm i am going to build and the new 9cm i have flying around as components here. Hope to hear you again next time. This time no operation from hill. 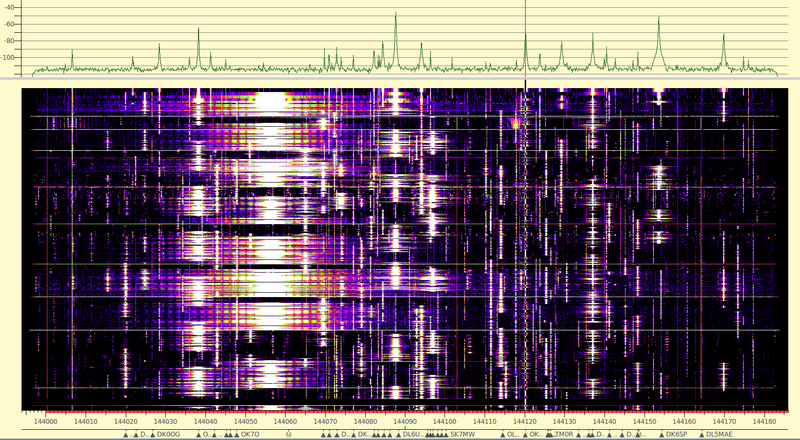 Just a few QSO from home. HiQSDR + ME2HT-PRO + PA + DK7ZB Oblong. Few hours of operation saturday evening and sunday afternoon. 78 QSO and about 18000 points claim. The screenshot shows the great Tucnak log. I will not tell who it was ;) Hopefully the signal can be improved. 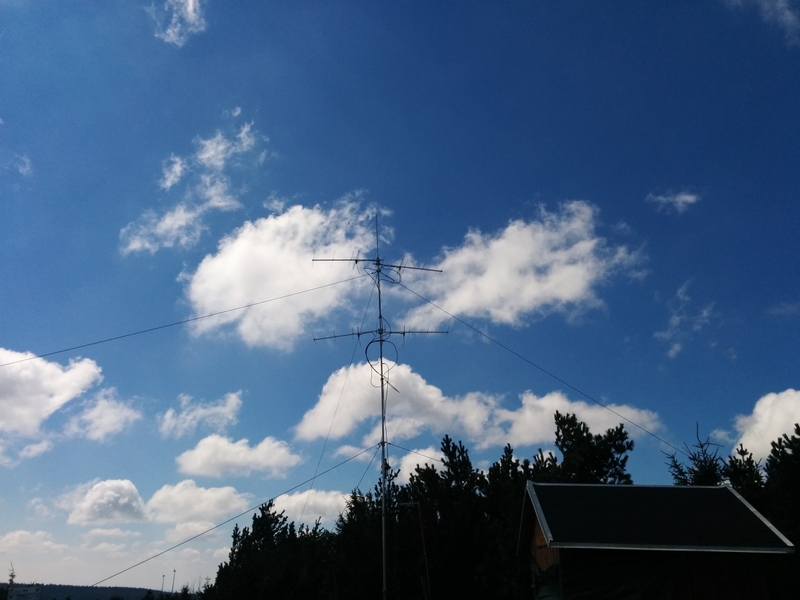 The weather in JO60OM was obviously quite good compared to other contest locations. A nice and warm Saturday, no rain during the night and sunny sky at Sunday morning. 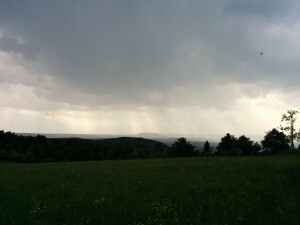 In afternoon it started raining and the rain continued until we were back home. 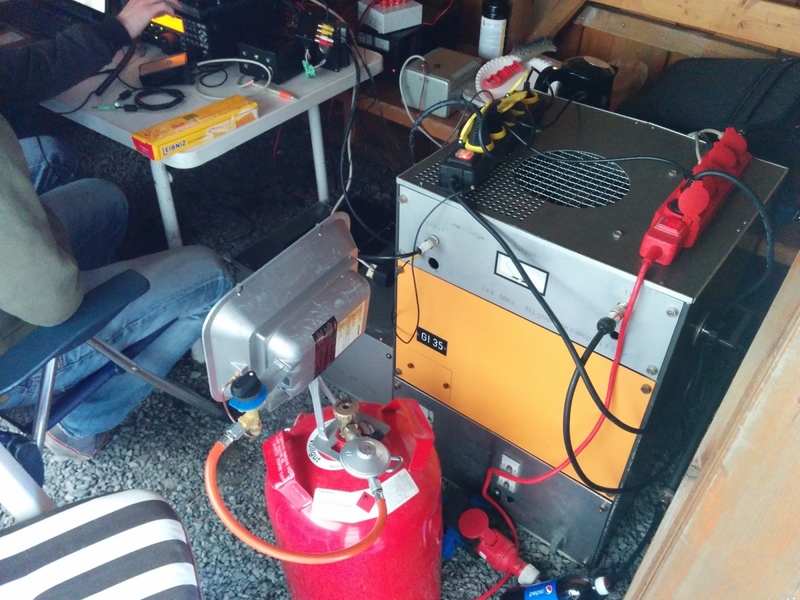 The equipment was running quite well. 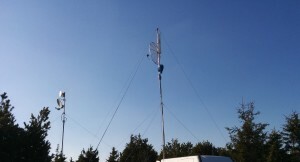 13/9/6cm was operated by 2 operator new to microwave under the DN5TA training call. The 23cm operation was nice with ODX G3XDY about 860km. But i had the impression that the activity is declining each contest. 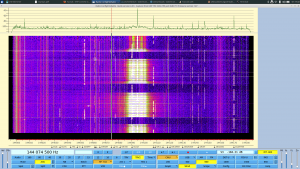 You really need to push the people in chat in order to get QSO done. 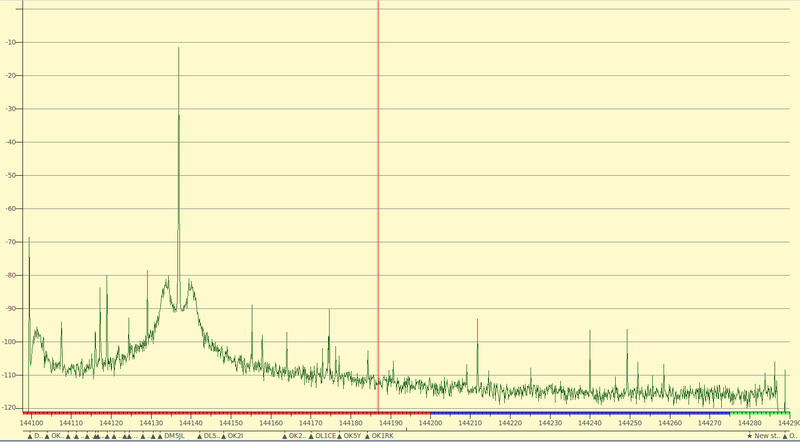 Between 0100UTC and 0400UTC even the chat activity almost stopped. The band was empty. My 1st place for 23cm in the german competition survived the logcheck. I am happy with the result although i have to say that there was only one strong competitor DK2MN in the single-Op class. Compared to may the 1st place result is about 12k less. The same points would have been place 9 in the multi-op class this time. Thats quite some difference. 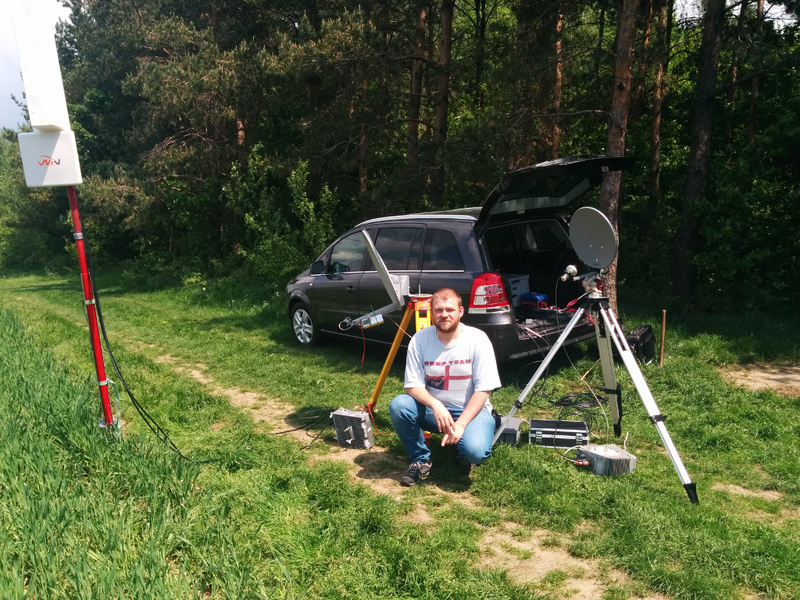 My unplanned 10GHz operation brought position 16 at least. 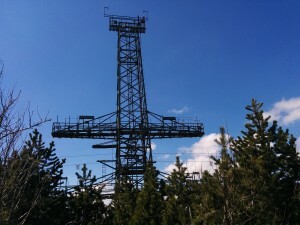 I was operating from JO60OM, Hirtstein. 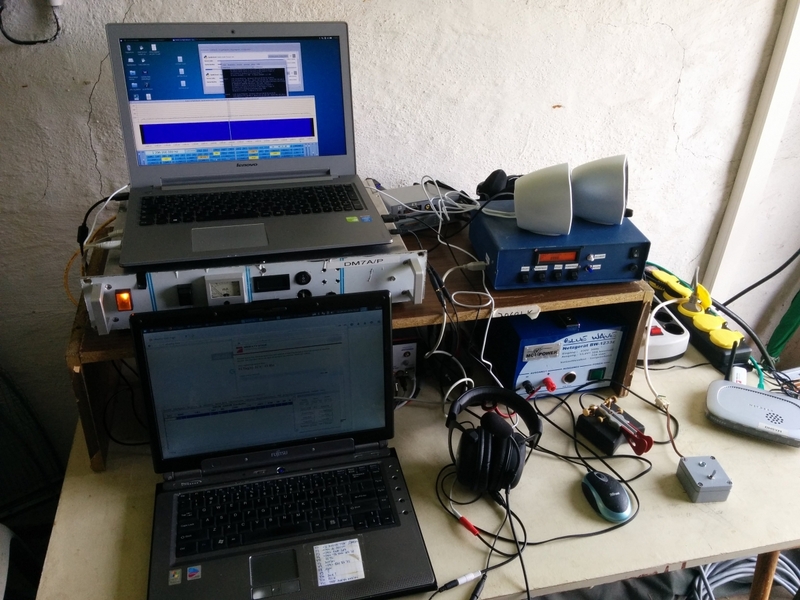 The equipment was as few times before: HiQSDR, DB6NT Transverter, PA 2x100W, 1.5m dish and Quados8 antenna. 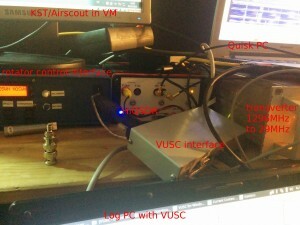 The thing that worked well for the first time was the control of the antenna from VUSC log via my rotator control unit. Entering the locator, press ctrl-?, here we go. 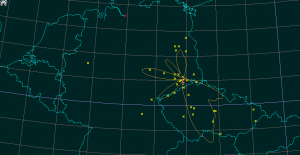 It seems because of the thunderstorms in many regions over Europe the activity was not very high. 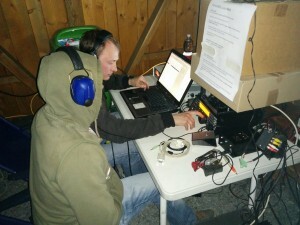 Still i made 107 QSO and about 25000 points. 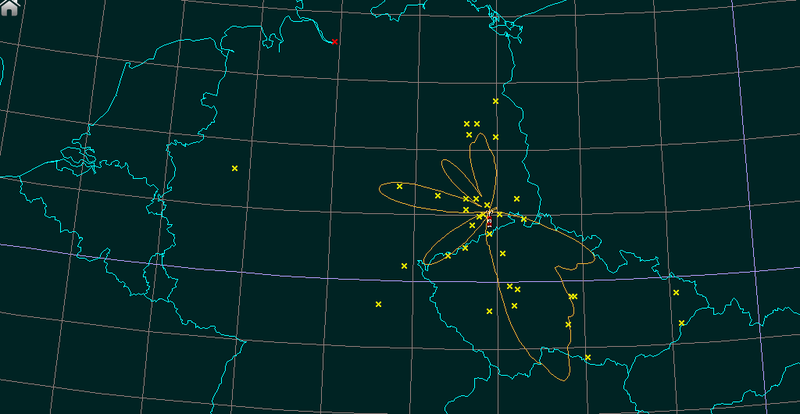 ODX was YU1LA 840km via aircraft scatter. 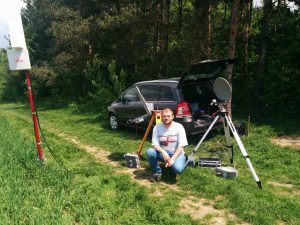 Saturday morning before the contest i decided to take the 10GHz transverter and the 40cm dish with me. That was a good choice actually. Although i just operated that on Sunday and only in north direction i made 19 contacts. ODX was PA0BAT about 500km. 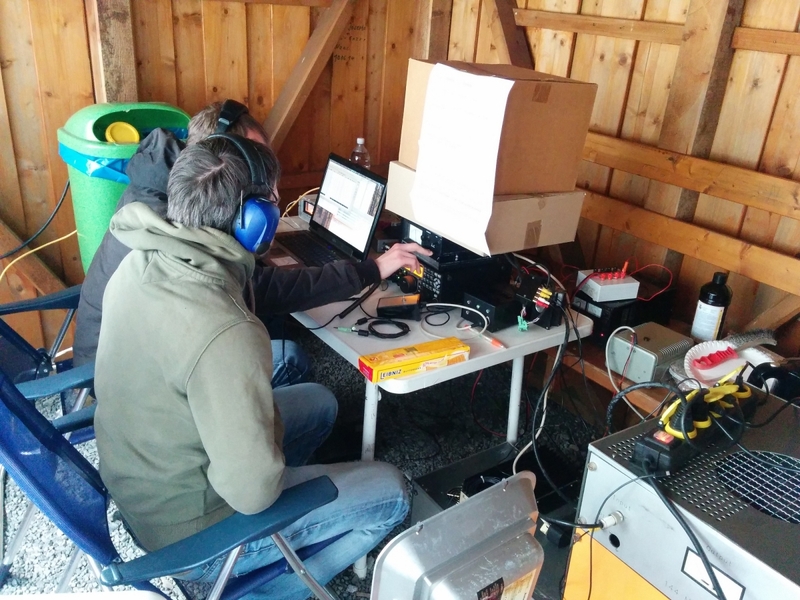 QRV with the DM7A team from Fichtelberg, JO60LK. We worked our various personal calls on 2m, 70cm, 23cm, 10GHz and 24GHz. The weather was sunny but very stormy. On 2m we tried a tiny 2x2x5ele setup for 2 directions. 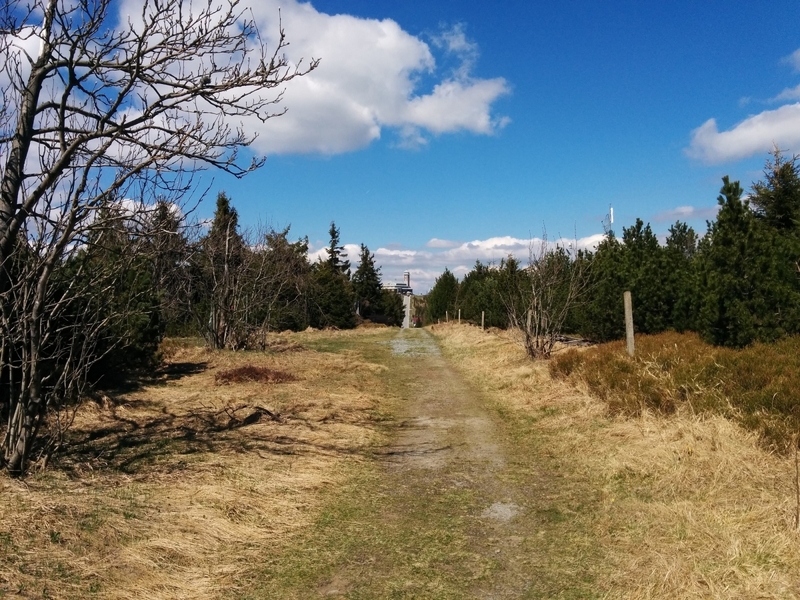 The gain was somewhat low but still the ODX was about 850km with YU7ACO. We had two newcomer with us who worked on 2m. Here an impression of the wind in JO60LK. This time i had to stay home. 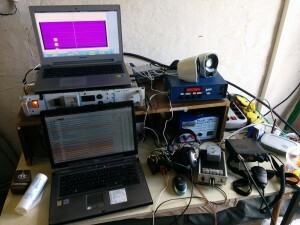 I used the little time to check the equipment for 2m. 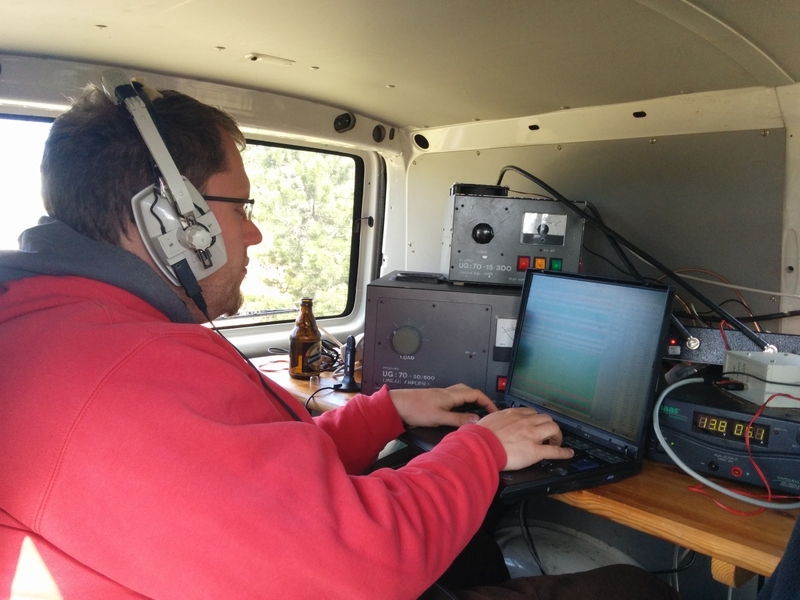 In the end i had 37 QSO in about 3 hours of operation time. Not a lot. Given that i just use a omni antenna i am still fine. 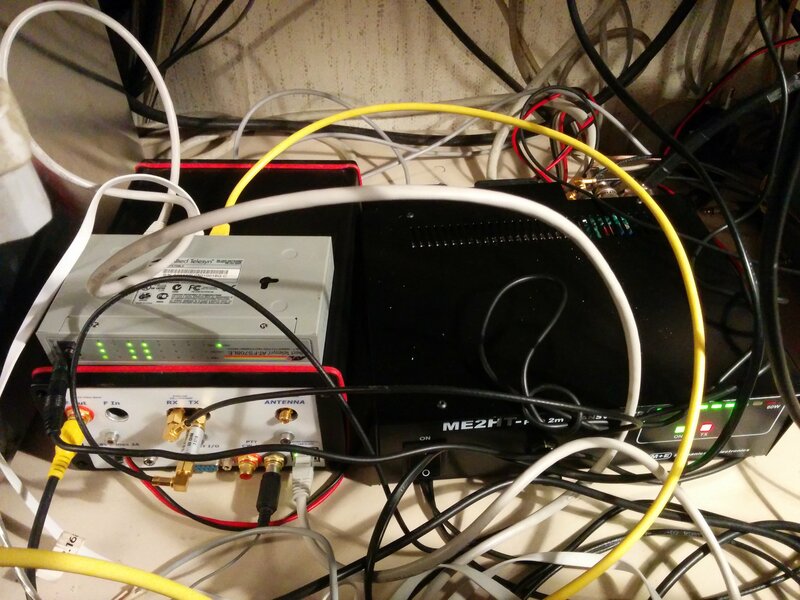 I used my HiQSDR + ME2HT setup. This time i used a Odroid board with cwdaemon for keying. 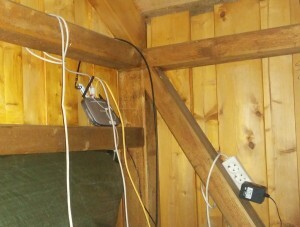 With that the rig can be placed anywhere in the house and the SDR/Log PC can be connected via wireless LAN. This enables contest operation from the couch without annoying the family by loud fans or clicking of RX/TX relais. 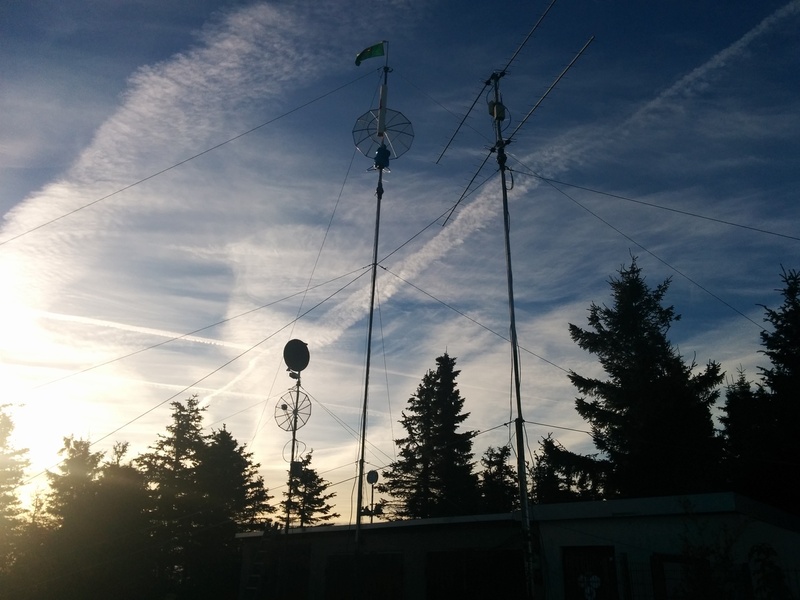 Last weekend i was able to participate in the Marconi Memorial VHF Contest. 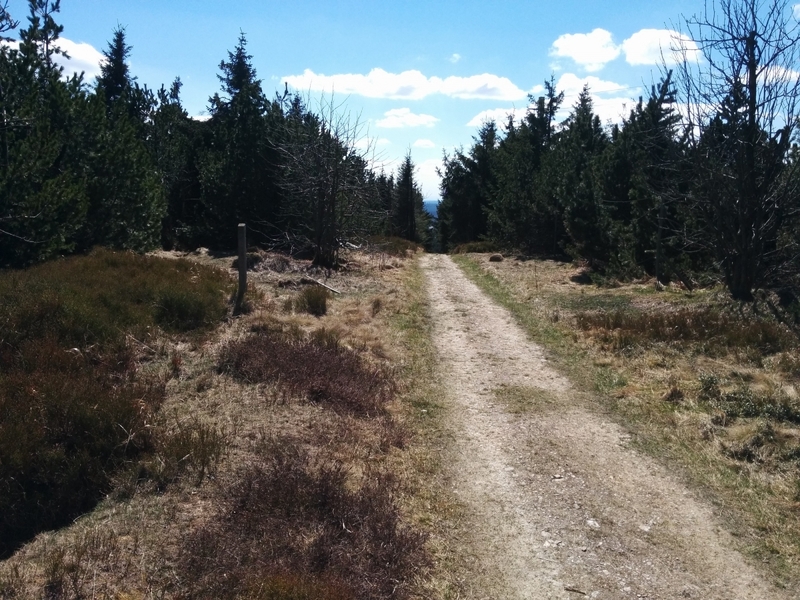 First of all many thanks to DL4DTU and DL3DTS for giving the possibility to use their great QTH in JO60TR together with the antenna group 4x9ele + the amplifier ! 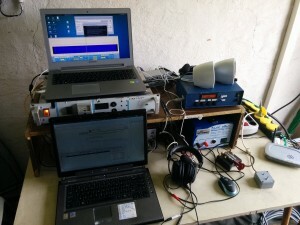 I used my HiQSDR already few contests before. 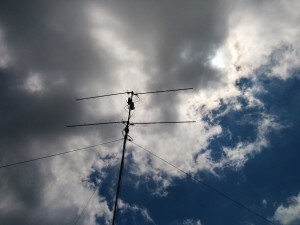 Now i wanted to try on 2m as well. I decided to purchase a ME2HT-Pro transverter which perfectly fits the transverter input/output of the transverter. You can see the setup on the picture below. 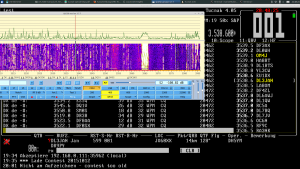 The SDR is controlled from the Quisk software. I usually use 196kHz bandwidth setting. This time i tried the CWSkimmer software. Quisk can forward the received baseband samples to a audio loopback device which is fed into the skimmer running under Wine. 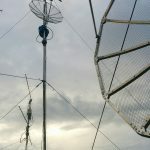 The big advantage of the skimmer connected to the local system was that i immediately noticed when DX stations were heading their antennas in my direction. Looking through the skimmer spots i noticed that i still missed quite some station from DX. 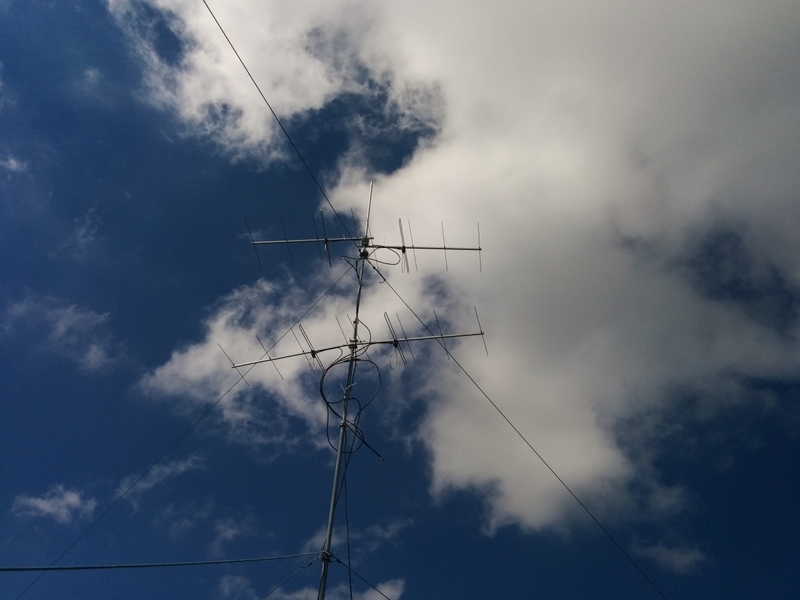 To avoid turning the antenna array all the time i decided to use a second antenna system. 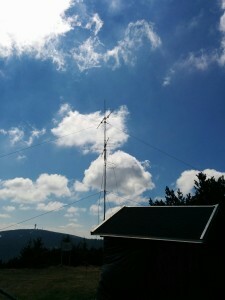 In addition to the 4x9ele of Norbert i mounted my DK7ZB-Oblong to one of the other masts at the QTH. The array ran with about 400wtts and the omni antenna with about 200wtts. Reception was selectable from either the one or the other antenna. In the next picture you see the map of the worked stations. 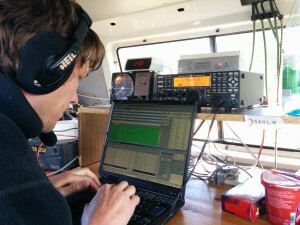 The result was about 250QSO and a bit over 80000 points raw score with a average of about 300km per QSO. Last but not least i want to show some spectrum screenshots from the contest. The Erzgebirge is known to have a high density of VHF contest stations from OK and DL. Therefore the band is very full. 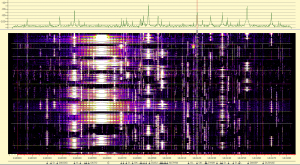 Within the waterfall history its a lot easier to find a free frequency than with a normal transceiver. You also see in which direction you need to move if one of the other close high power stations comes too close. 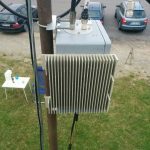 For the close high power stations you can also see the problems of the different transmitters that can cause wideband interference. This is really a poor example since the noise is less than 70dB below the carrier. In that example the spectrum of the oscillator is a lot better. 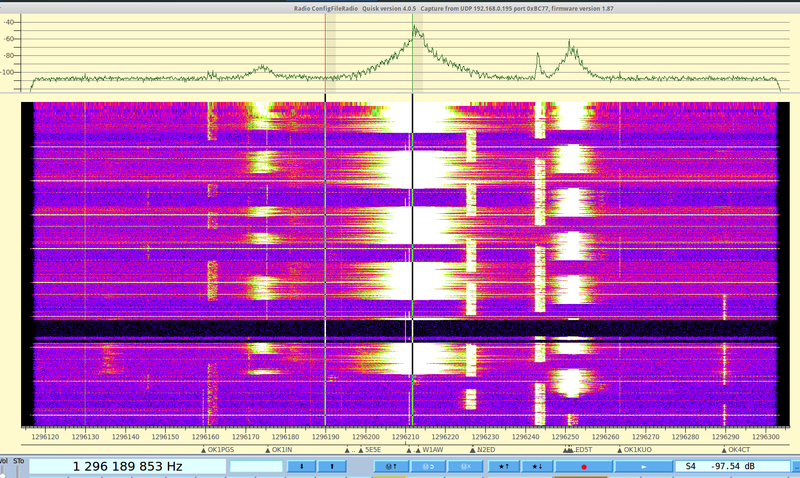 But the hard keying of the TX causes leakage to other frequencies about 85dB below the carrier. The level was rather low but remember the proximity and the high antenna gain and TX power. 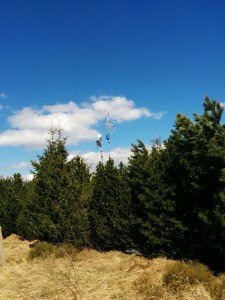 I wonder if someone can give me honest feedback about my own TX signal…? 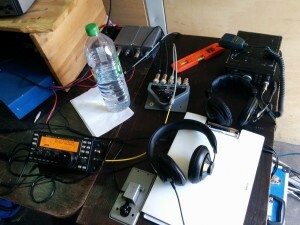 In preparation for the Marconi memorial contest i tried to improve my setup. I use my HiQSDR with Quisk. 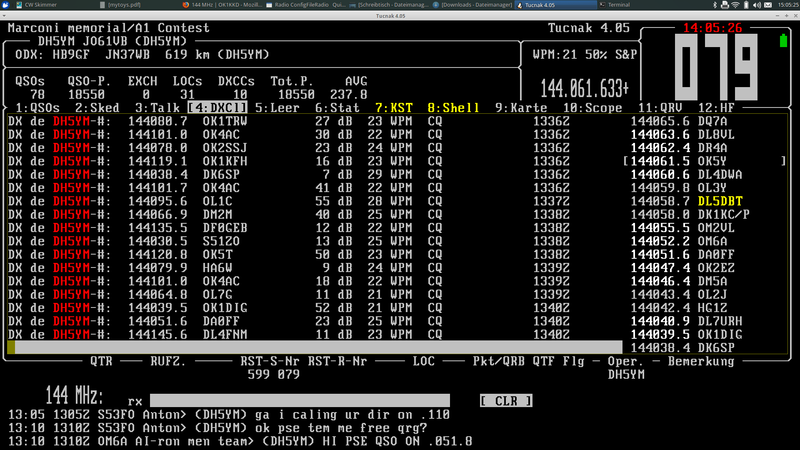 Since a few versions Quisk has a built in DX Cluster client. 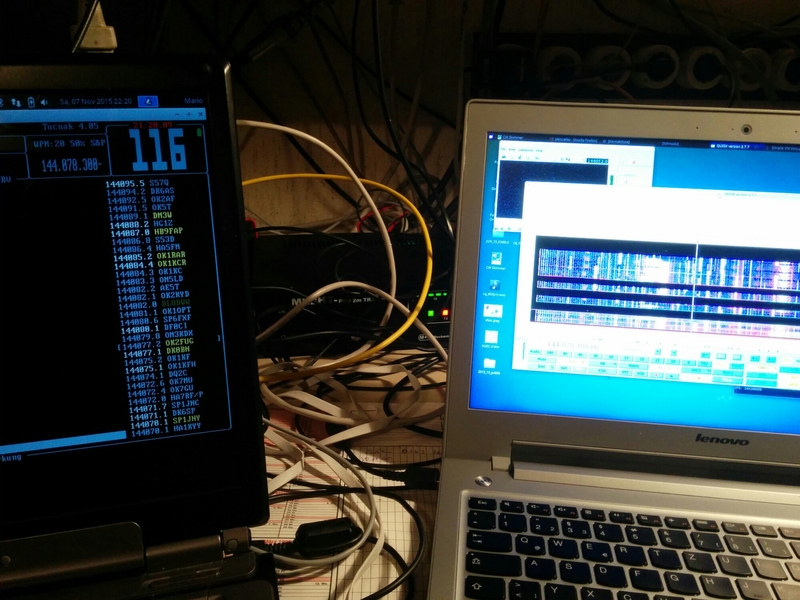 Quisk forwards its baseband samples up to 192kHz bandwith to the skimmer and i managed to send the skimmer/lo_freq command if the center frequency of my hardware changes. The nice thing is that all decoded calls are printed right below the waterfall. 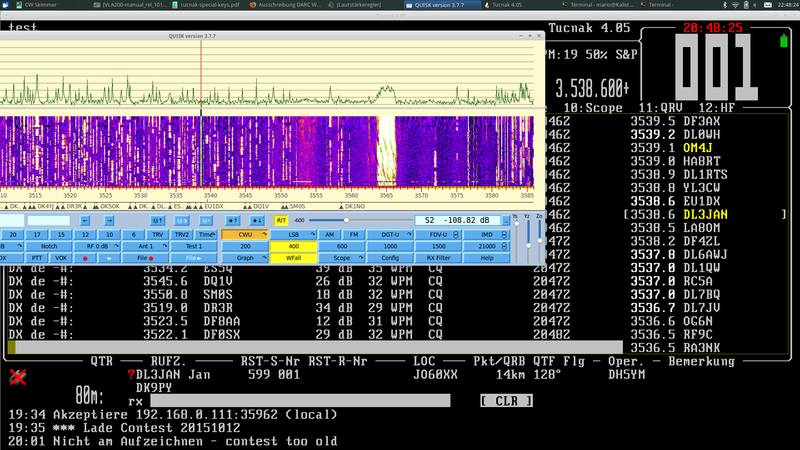 The rest is reading the skimmer into the very nice and powerfull Tucnak log of OK1ZIA. 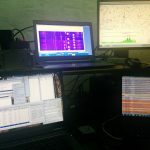 The software mainly is a log for VHF/UHF/SHF contest operation. Lada also implemented a nice new feature. Now its possible to zap through the calls in the bandmap with ctrl-arrow and Quisk is automatically controlled via Hamlib. Further features of Tucnak are integration of ON4KST chat, airplane scatter prediction, cw keyer, ssb keyer, recording of all contest audio and a lot more. 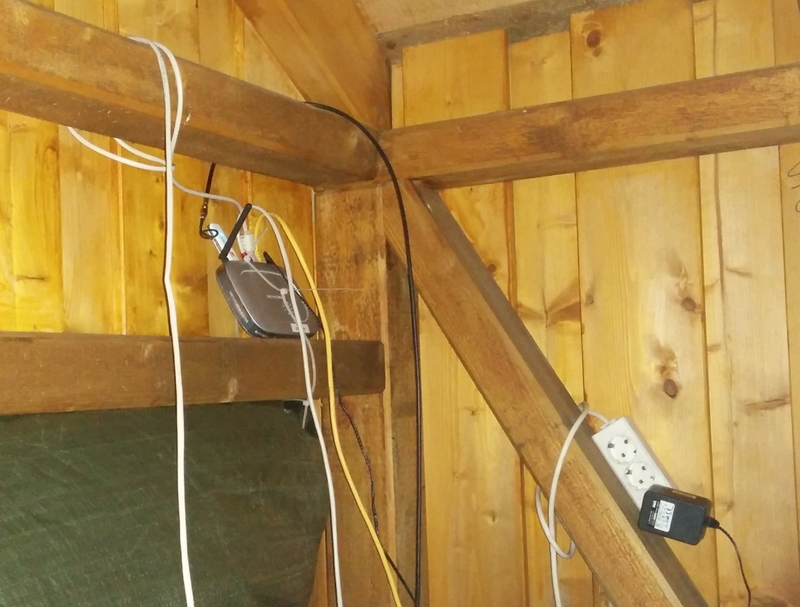 It can also work in environments with multiple stations connecting several Tucnak logs together. Available for Linux, Windows and Android. QRV from JO60LK on 23cm. The picture shows the setup. The HiQSDR was connected to the 23cm to 29MHz transverter. 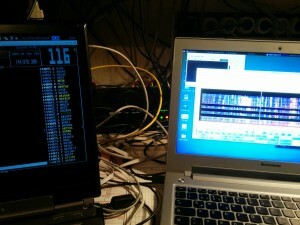 The Quisk software runs on my i7 notebook. On the same machine i ran Airscout and a client for the ON4KST chat. 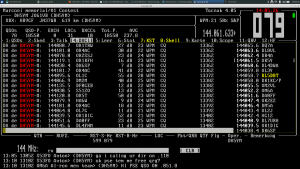 The notebook below runs the VUSC log under Linux in Wine. 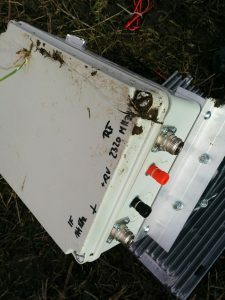 The log features a CW keyer which connects to the transceiver via the interface box in the middle. 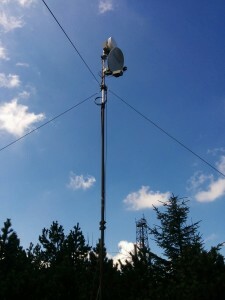 The rotator control at the left side can be controlled from VUSC as well and direct the antenna towards the locator entered. 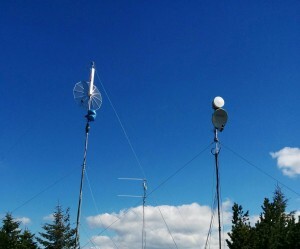 The output power was 2x100W with 1.5m dish and Quados 8.